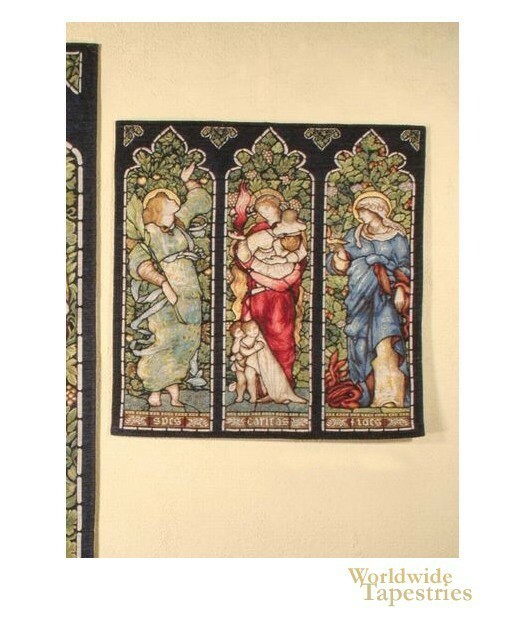 This tapestry Hope Charity Faith shows the three virtues in the resemblance of stained glass windows. The three virtues are depicted here in this religious tapestry, as we see gorgeous red robes in the centre panel adorned by saint of Charity with charitable acts with children, and the other two saints representing Hope and Faith, in green and blue robes. With the appearance of stained glass windows, these church theme tapestries shows the artistry of both tapestry and stained glass works. This religious tapestry is backed with a lining and has a tunnel for easy hanging.